What Is an Emergency Medical Technician? An emergency medical technician, or EMT, provides emergency medical care for the sick or injured. Although the career is high-stress and can take a physical and emotional toll on those who choose it, it is also rewarding in that it offers an opportunity to give back to the community first hand. EMTs are usually one of the first responders on the scene at car accidents, fires, natural disasters, medical emergencies, and other chaotic situations. It is no wonder, given the opportunity to help our most vulnerable populations, coupled with a fast-growing job market, that more and more people want to become certified EMTs. Are Certifications Necessary to Become an Emergency Medical Technician? All EMTs must register with the National Registry of Emergency Medical Technicians and pass the necessary exams before receiving recognition and certification as EMTs. Certification can be stratified into three levels: EMT-Basic, EMT-Intermediate, and Paramedic. Each role requires its own set of coursework and examinations. Who Can Become an Emergency Medical Technician? Have completed at least 10th grade. Be certified in cardiopulmonary resuscitation (CPR) from the state healthcare provider. Not have any criminal background. Be vaccinated against measles, mumps, rubella, and tetanus. How Long Does It Take to Become an Emergency Medical Technician? EMT basic training, which leads to certification can take as little as three weeks to as long as two years depending on one’s professional goals and the state in which one plans to practice. Most students who opt to become basic EMTs finish their coursework in 3-6 weeks, though up to two years of coursework is available if they wish take on more responsibilities. A basic course will consist of 120 to 150 credit hours worth of courses, usually offered at a community college or technical school. These courses cover a variety of topics that are necessary to becoming an effective EMT. Basic knowledge of the human body is taught, focusing on reading vital signs, airway management, obstetrics and gynecology, shock and bleeding management, and head injuries. It will also be imperative to learn how to physical manipulate patients by practicing how to properly life and move them, dealing with infants and children. Most schools will also require a course in medical and ethical issues in healthcare. Most of the coursework will be limited to absolute necessary information as the timeframe of a basic training course is rather short. The coursework necessary to complete a basic EMT training course is not as challenging as those of other healthcare fields or that of an intermediate EMT or paramedic training course. However, it will be a lot of information crammed into a short time period, and students should expect to put in maximal effort at all times. On top of 120-150 in-class hours of coursework, hopeful EMTs must also get face time with patients in mock emergency situations where they become familiar with the equipment, practice patient assessments, and learn to deal with high-stakes situations. This gives would-be EMTs hands-on experience in a controlled setting that gives students a sense of what an EMT’s duties and responsibilities are. This portion of the training is highly practical and is a culmination of all the coursework that preceded it. After a hopeful EMT has completed all of his or her coursework and graduated from the program of his or her choosing, nationwide examinations must be taken. The National Registry of Emergency Medical Technicians (NREMT) is responsible for the examination and certification of EMTs nationwide. It is through NREMT that potential EMTs will need to register for both the Cognitive Exam and the Psychomotor Exam. Registration for these exams require verification of the completion of an EMT program as well as an application fee of $70. The cognitive exam is a computer adaptive test which covers all the subjects EMTs must know to be effective. These topics include the different pathways in the human body, which include respiration and ventilation through the airways, cardiology and resuscitation, trauma to various parts of the body, obstetrics and gynecology. Questions asked during the cognitive exam will focus primarily on adult and geriatric patients rather than infants and children. In addition, general EMS operation will be tested. It can be generally said that the information tested on the cognitive portion of the exam corresponds with the in-class coursework done during training. If an applicant is unsuccessful in passing the cognitive exam, the NREMT will offer feedback for improvement. Applicants are allowed to retake the cognitive exam again 15 days after the previous attempt for a total of six times. After three failures to pass, applicants must undergo 24 hours of remedial training. After six failures, they must retake the entire basic EMT course from the beginning once again. The psychomotor exam is taken after the passage of the cognitive exam. The psychomotor exam covers the more hands-on aspects of being an EMT. Interactions with a patient, including assessment, management of a trauma patient, and administering oxygen to a patient who cannot breathe are tested. Controlling bleeding and shock is an important section of this examination as well, as they are generally the first things EMTs must deal with. In addition to working with the psychological aspects of patients, EMTs are also tested on more clinical parts of their job like immobilizing long bone fractures and dislocations, traction splinting, upper airway adjuncts and suction, mouth-to-mouth ventilation, and other procedures EMTs must be completely familiar with. Just as the cognitive exam corresponds with classroom coursework, the psychomotor portion of the exam mirrors the hands-on experience that every student must undergo during basic EMT training. After passing the national psychomotor exam, hopeful EMTs must also pass a state-level psychomotor exam and need to contact their State EMS Office or an instructor for further information. Is There Room for Advancement Once I Am a Certified Emergency Medical Technician? Basic EMT training is only the shortest route to working in emergency medicine. Once basic EMT certification is obtained by a student, he or she may choose to work immediately or continue working up the ranks. The next level up from basic EMT is intermediate EMT, which requires another 300-350 credit hours of coursework and another set of examinations from the NREMT. An intermediate EMT takes on more responsibility than a basic EMT and must be familiar with more advance airway adjuncts, non-medical IVs and the administration of certain drugs such as glucagon or Narcan. A paramedic is the highest level of emergency medical response and requires a strong foundation in human anatomy and physiology. Paramedic certification usually requires a two-year associate’s degree. Coursework usually includes anatomy, physiology, paramedicine, defibrillation, as well as other advanced medical procedures. Because of the extensive training necessary, greater responsibilities, and high amount of patient contact, paramedics enjoy much higher salaries than a basic or intermediate EMT. How Much Does Emergency Medical Technician Training Cost? 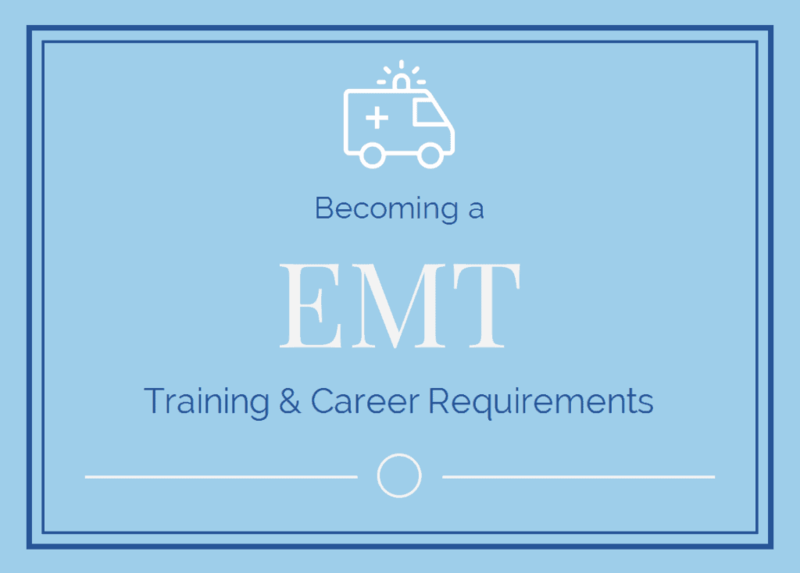 EMT training can take as little as three weeks for the most basic coursework, but dedicated students may take up to two years to earn an associate’s degree. The costs of these programs vary according to their length and content. A basic EMT course usually costs around $650. An intermediate EMT course usually costs an additional $800. A paramedic course usually costs around $3,500. How Do I Pay for Emergency Medical Technician Training? Going into a training program full time can be a huge financial strain both in terms of the loss of wages while not working as well as the cost of the training itself. Fortunately, scholarships are furnished by the National Association of Emergency Medical Technicians (NAEMT) to help provide funding for hopeful EMTs who wish to serve our community. EMT-Basic students are eligible for up to $500. EMT-Paramedic students are eligible for up to $5,000. Paramedics looking to pursue advanced education are eligible for up to $2,000. How Long Do I Have Certification Once I Receive It? EMT certification lasts for two years before it must be renewed through the NREMT. Recertification can be done online through the NREMT website so long as the EMT applying has a login. Forms are available in the form of pdf files. If an EMT certification is lapsed with two years of expiration, applicants must complete an EMT refresher course before reapplying for certification. If an EMT certification has lapsed for more than two years, the applicant must provide proof of completion of an EMT training course, complete a refresher course, and retake both the cognitive and psychomotor examinations. It is extremely important to maintain EMT certification once it has been conferred. The status of your certification can be checked at any time through the NREMT website.